Google Analytics is almost the default free service for any blogger, and for good reason. It’s a solid service, essential for anyone needing to track visitor statistics and create a successful blog. The biggest complaint I hear around however is over the fact Google Analytics doesn’t have any kind of ‘live tracking’ functions, statistics refresh just once per 24hours which can become a pain with time. Woopra is a real-time tracking service with a huge range of features and is also completely free at the moment, although premium services will eventually be available. Woopra is also in private beta, although by signing up there’s a good chance you’ll be accepted fairly promptly. Current restrictions also include the number of websites you can have tracked for the beta. Woopra is a desktop application, although a basic version exists online, nothing compared to Google Analytics however. I prefer using a desktop program however as they perform better, can have more intuitive interfaces and more advanced features. 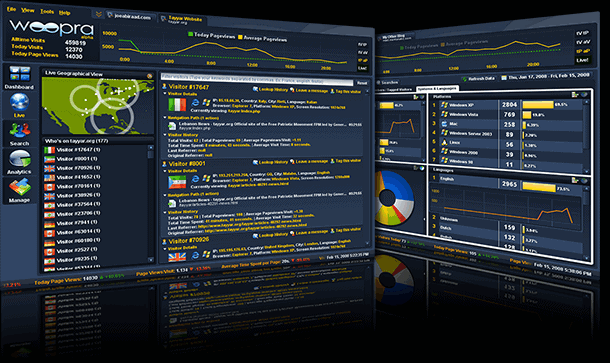 Visitor tracking updated in real-time, dozens of other analytics updated several times a day. Live tracking is particularly useful for reacting to sudden events such as a Digg traffic surge etc. Great UI combined with easy to use data representation tools and overlays. A little creepy, but you can make a chat box pop-up in any site visitors browser. Not sure how many people would accept this and have a conversation. 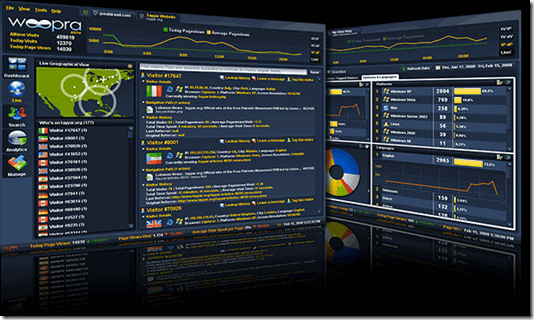 Recognise and monitor types of users and regular visitors. Define actions then receive notifications. Integrate with WordPress (and other blog platforms) to get dashboard access to Woopra statistics. Also a wide range of developer tools enable plugins and applications to take advantage of the Woopra platform. I highly recommend you giving this service a try! What is weight of script it adds to page? PS chat feature really wins “freak out your your reader” competition. Btw it’s not really true that Google Analytics only refreshes once every 24h, you simply have to select the current day as well to see those stats. what about statcounter. it is free and gives you all the stats. real time tracking too. and statcounter is not even beta. how does Woopra compares to statcounter? Ok, I hunted their woopra.js in the wild… 6Kb. If I am not missing anything and it doesn’t load more – I am VERY impressed. OMG I will use this just for the chat thing!!! Thanks!! >I will use this just for the chat thing!!! I’ve been using it for 2 weeks and the most I like most is its accuracy. There’s isn’t, however, the option to filter your own visits yet.